Growing up in Wisconsin, I have to admit I only discovered artichokes in my 20’s, and then in the form of a jarred variety marinated in olive oil. ‘Ya know, they weren’t potatoes or broccoli…’ They’ve been an anomaly to me as to how I get those otherwise hard, venus-flytrap-like, plants into something mildly edible… until now. Did you know that artichokes are a thistle? Yes, that correctly. 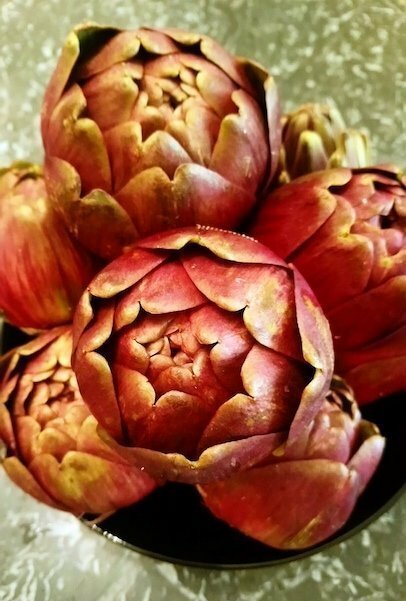 Mediterranean artichokes, or any variety for that matter, are in fact, a thistle. We’ve been munching on these otherwise prickly plants in the form of artichokes or cardoons since the times of ancient Greece and Rome. They were even said to be an aphrodisiac. Hmmm. Put that under your pillow! They most likely originated out of North Africa, Sicily or Greece, and the scientific name is Cynara Cardunculus. I know, that sounds vulgar! 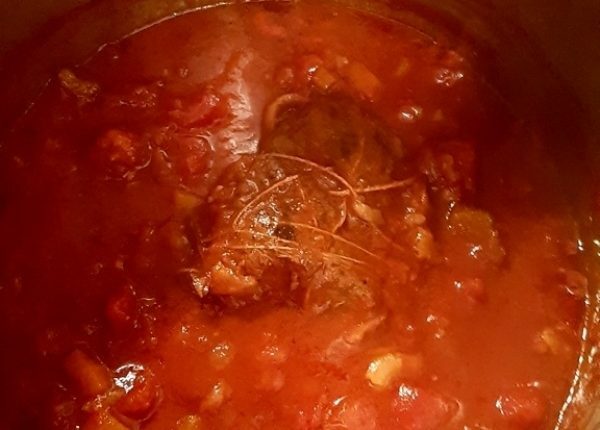 I was researching what Italians have for their traditional Easter menu, and besides lamb, lamb and lamb, artichokes kept coming up. I thought, ‘Great. 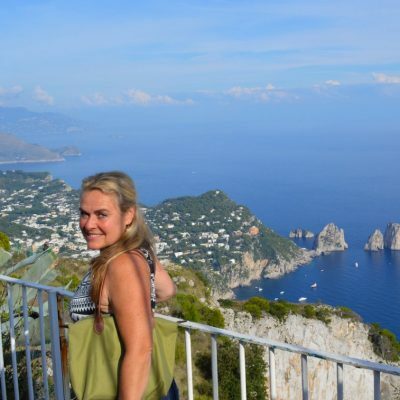 I’m going to conquer this one.’ So I went to Italy for the day just before Easter to the market in Ventimiglia to see what was fresh. And true to order, there were mounds and mounds of artichokes. I knew nothing about any of the varieties – there were green ones and reddish ones. I thought the reddish ones were cute (Ya know, important decisions) and so I went with those. 10 artichokes for $5. Ok, it could be the best or worst 5 bucks I’ve spent, but I was keen to give these a go. I discovered artichoke season in Italy will range from December to March depending on where the artichokes come from. It’s also the reason artichokes are frequently on the Easter menu. 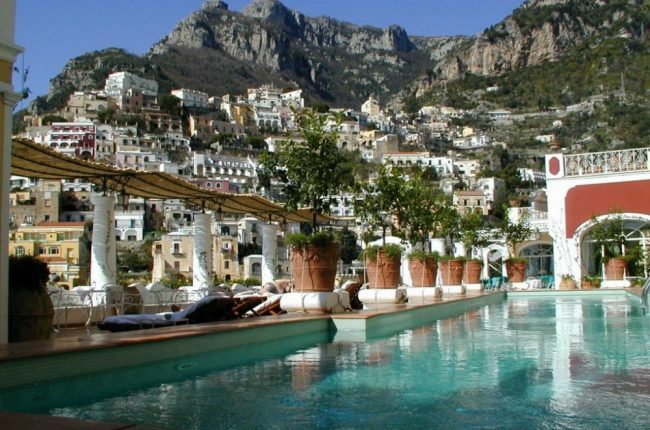 The ones I get in Ventimiglia probably come out of Puglia or Sicily. 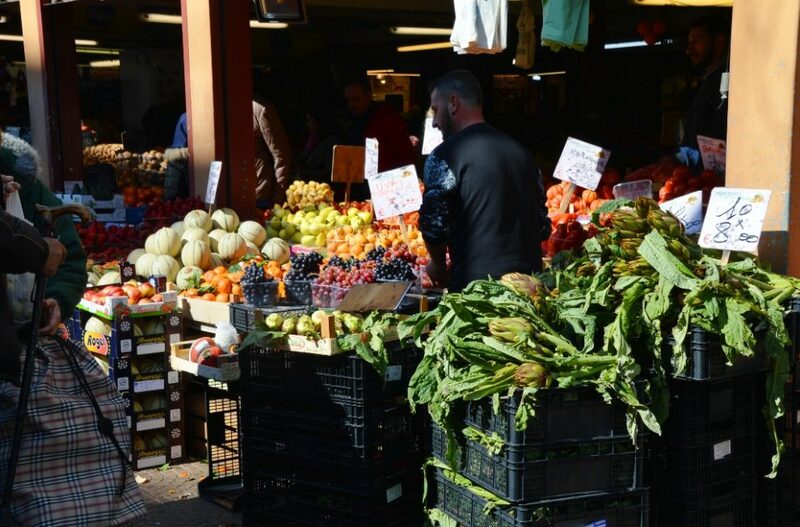 I love that market as they often have fresh fruits and vegetables from Southern Italy. I was also surprised to discover there are so many varieties of artichokes, but we mainly eat a few common ones: Globe Artichokes, which are more rounded; and Violetta Artichokes, which are thinner, longer, and usually a more red/violet color. 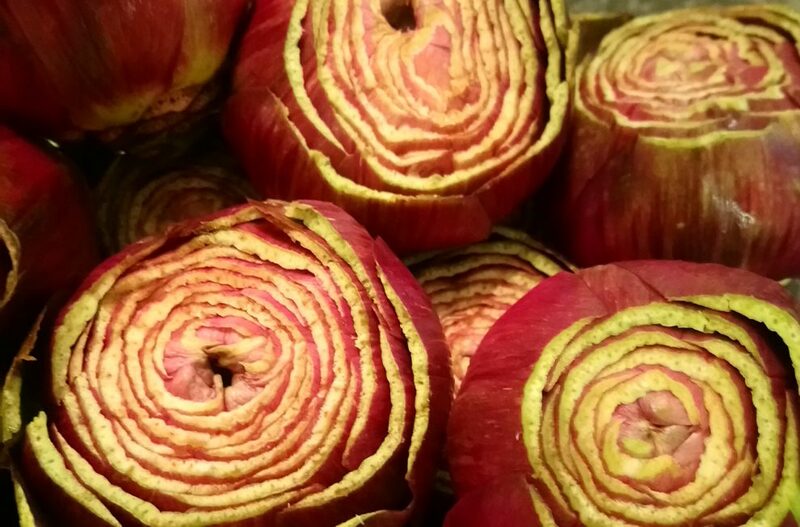 But there are also baby Ansio, Mercury and Siena artichokes which are grown in Central Italy. 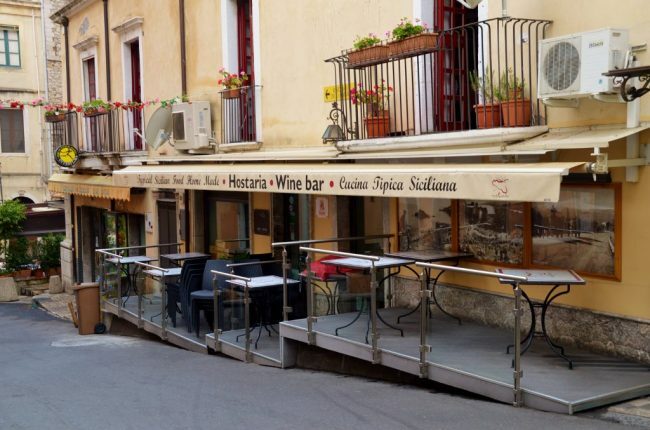 There are also Fiesole artichokes, which come from southern France, and Chianti artichokes, which are of the Italian Romanesco variety. Then you have Jerusalem, Jordan and Omaha varieties of artichokes. They all differ in size, color and the thickness of their leaves. Then I received a couple of vocal recipes from the sister of a friend who’s from Naples. I assume these were her mum’s recipes. 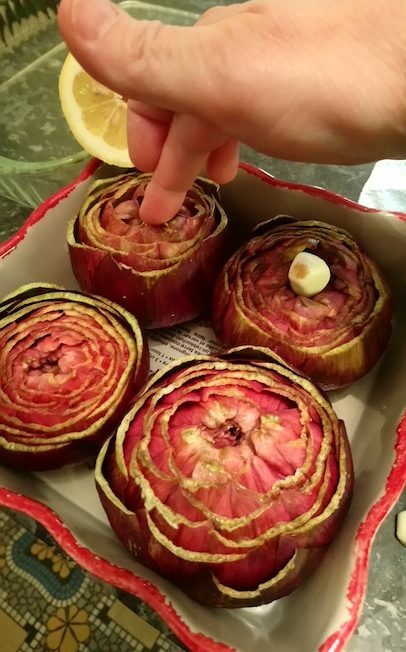 One was to rinse the artichokes in water and lemon so they don’t brown. Dry them off, do an egg wash, ‘flower’ them and fry them in oil. Uggg. I’m not great at frying anything other than my hair with the hairdryer! The other was to simply steam them in a double boiler bath that has garlic, oil, parsley. After they are tender in about 20-30 minutes, they can be served by dipping the leaves in olive oil, salt and pepper. Then you scrape them through your teeth. Hmmm…. 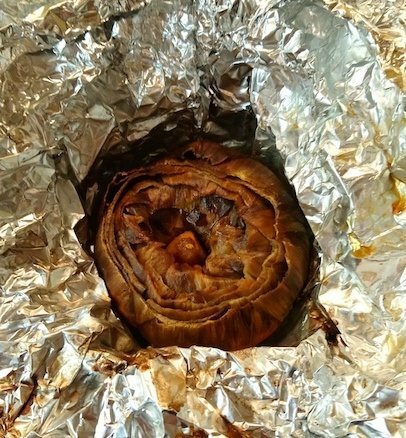 So, with my 10 artichokes, I decided to try two different recipes and this is what I did. Cut about ¼ of the TOP of the artichoke and trim any remaining pointy leaves with a scissor. Prepare a double boiler adding enough water to hit an inch or so below the boiler pan. Add a couple cloves of minced garlic, squeeze in juice from a whole lemon and I added a bit of cardamom/coriander spice. You can also add parsley. 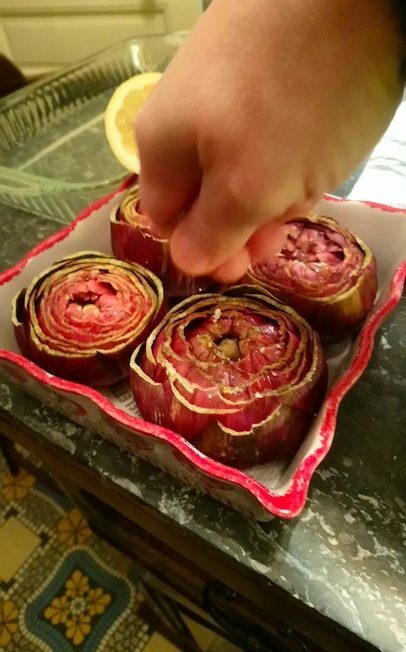 OR you can also put these INSIDE the artichokes as well. 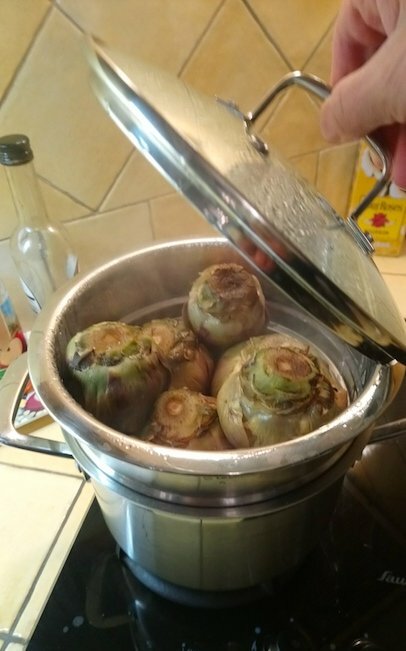 Steam the artichokes with the head down in the basket (if you put the garlic, oil, lemon and spices in the water) or upright if you put the garlic, oil… inside the artichokes) for about 20 minutes first to see if you can insert a knife in the base. If it’s tender, it’s done. If not, wait another 10 minutes. I steamed it for about 30 minutes and it was a bit too done, but it depends on your taste. 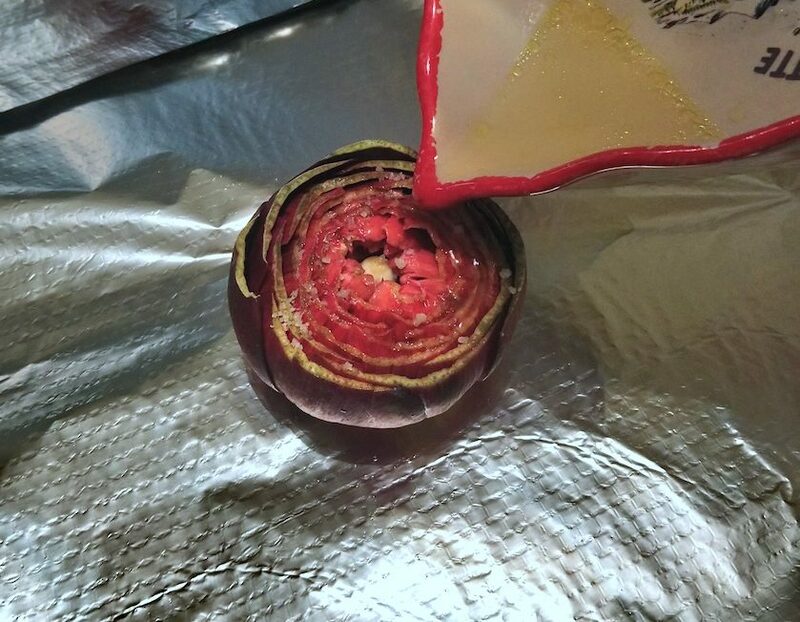 *BE CAREFUL when you start opening the leaves in the middle of the artichoke. I was sticking my fingers in there and that thistle bit is still very prickly to the point where it will seriously draw blood if you are not careful. 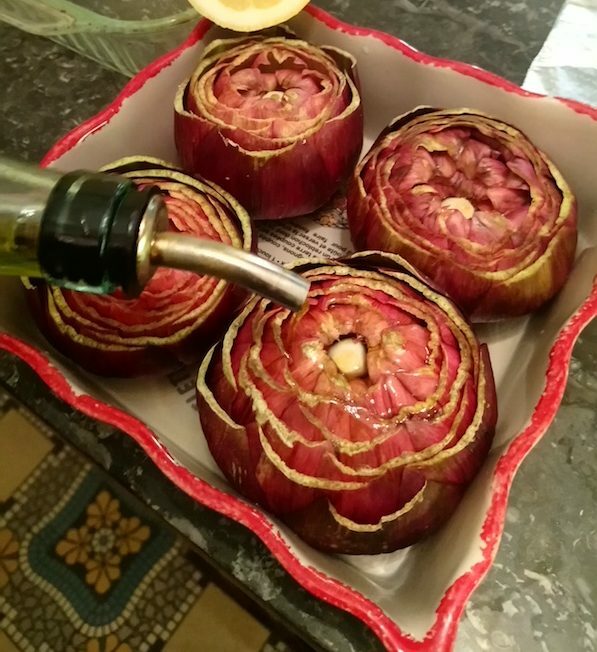 Put the artichokes on a piece of aluminum foil and drizzle a bit of the lemon/oil that is in the bottom of the preparation pan. There’s a bunch that seeps out! 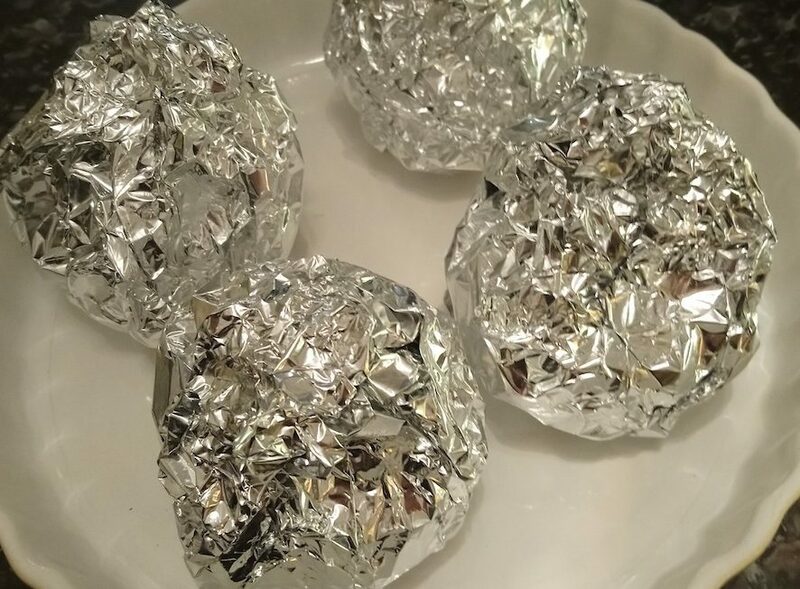 Fold up tightly in one piece of aluminum foil and then double wrap in another piece of aluminum foil. 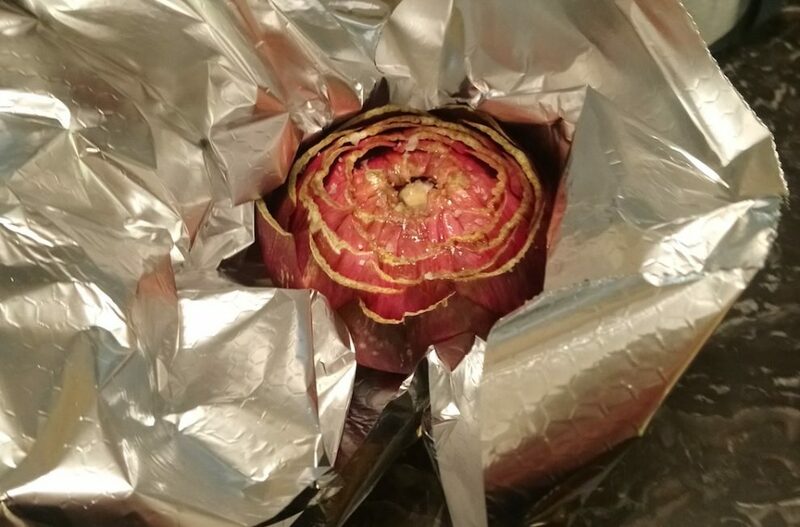 Put the artichokes into a baking dish and put them into the oven for about 1.5 hours on 425F. I used about 225C and it worked just fine. I actually liked the baked version better as the leaves had more flavor and you didn’t need to prepare a dip. The leaves were more tender all around and there was more meat to eat. The steamed ones were good, but I felt like I needed more ‘stuff’ in the water for the artichokes to actually absorb. They were tender and I used an olive oil, salt and pepper dip, but the garlic/spices I added didn’t seem to add much. Next time I will definitely steam them upright. Artichokes are actually quite filling even though they don’t look it. I thought 10 would be a small appetizer, but they are quite substantial overall. Hope you enjoy!! Thanks Crystal. To be honest, I thought this would be a complete failure. I had no idea how easy it was. It does take a bit of time and steaming is easier but the baked version were more flavourful. Let me know how it goes for you! And thanks for the comment. Those look almost too pretty to eat…almost. They were surprisingly much more easy to prepare than I had imagined. Will definitely do this again. Thanks for your comment!